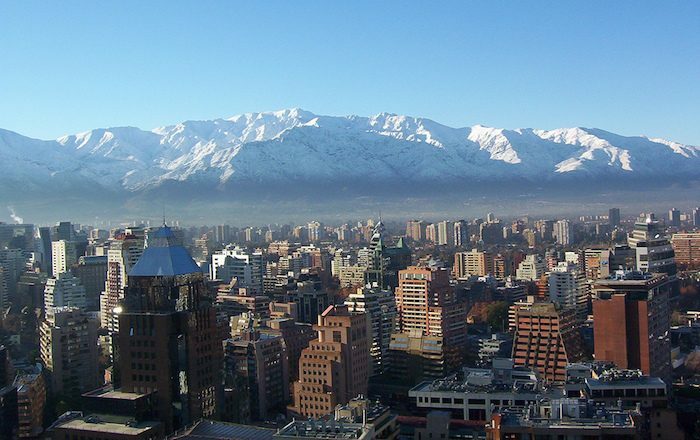 Santiago de Chile is the country’s capital and largest metropolis, positioned almost smack in the middle of this long narrow country between the Andean mountain corridor and the Pacific Ocean. This city is largely made up of narrow side streets and 19th-century neoclassical architecture interspersed between hills, parks, and the Mapocho River. While the air in Santiago is somewhat polluted and smoggy, the views of the Andes rising up above the skyscrapers are breathtaking in and of themselves. 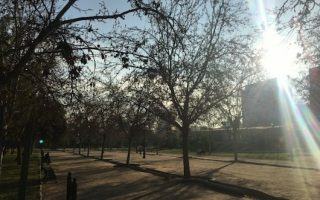 Our guide to running in Santiago features some of the city’s great parks and neighborhoods with good streets for running. Running is not terribly popular in Chile (so you might get some weird looks! ), but being such a large city, Santiago has it’s fair share of enthusiasts who have congregated to found races, stores, and running groups. Because the streets are not designed for running, the best places to run in Santiago tend to be the parks like Parque Forestal, Cerro San Cristobal, and Parque O’Higgins. Some neighborhoods, like Vitacura, have decent road running. Like many cities developed before modern public transportation, Santiago can be maze-like and confusing to navigate. However, they do have a very reliable Metro and bus system which will get you pretty much anywhere you want to go. If you plan on being in town for even a few days, it’s worth it to purchase a Bip! Card, the easiest and cheapest way to charge your fares. 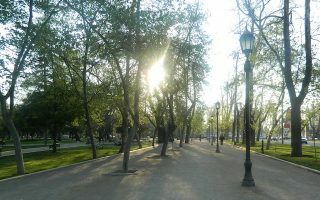 A series of three parks forms a riverside greenway, including Parque de los Reyes, Parque Forestal, and Parque Balmaceda. 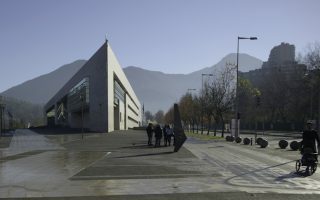 Also incorporates several Santiago museums and monuments. A full loop is 11.4 km (7.1 miles). 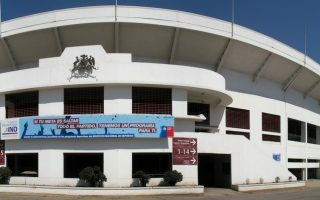 This 3.2 km area around the national futbol stadium is the athletic center of Santiago, with plenty of activity to inspire your run. The high-end Vitacura neighborhood in the northwest part of the city has some good streets for running, and the Parque Avenida Americo Vespucio corridor park, with with a nice multi-use path running it’s length. We gave 7 km and 10 km loops. If you’re visiting Chile in anticipation of some mountainous adventure, the Parque Bicentennial, better known as Cerro San Cristobal (Saint Christopher Hill) is an awesome training run to gain some elevation. Two adjoining parks with pleasant paths, forming sort of an oasis in the busy Las Condes part of Santiago. It's possible to do a 3-4 km perimeter loop, all off-road. Lots of green space, an ice rink, skate park, exercise equipment, cafes. 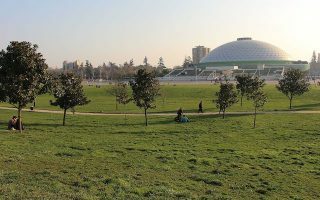 Located in the southern part of the city, Parque O’Higgins is a popular spot for picnics and outdoor recreation, including running. Although the park is not very large, you can fit a 4 kilometer circuit in by looping around the perimeter of the park. 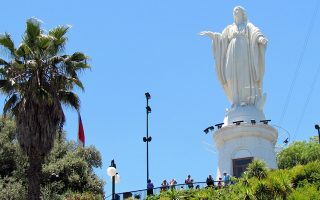 Santiago has a Mediterranean climate, with warm summers and mild winters, with relatively low amounts of precipitation. Summers, which are December-March, average in the high 80s (29C) during the day, but coolish nights with lows in the 50s (11C). The air is dry and precipitation is rare in summer. Wintertime (June-Sept) temperatures are in the mid-50s (14C) during the day and 30s at night (2C). Ice and snow are rate. The bulk of Santiago’s 11 inches of annual rain falls in winter. Chile.Travel is a good resource for tourism and places to stay. There’s a good cluster of hotels on the south side of the Mapocho River, fitting of a variety of budgets. If you stay downtown, between the river and Av. Libertador Bernardo O’Higgins, and west of Baquedano Square, you’ll be the heart of Santiago and near some of our good river/park runs. The You Can Run Club has group runs. The Newton Running Store and Santiago Mountain Running Company are good bets for shoes. See our map for locations and group runs. Visit Corre Chile for an updated list of races.